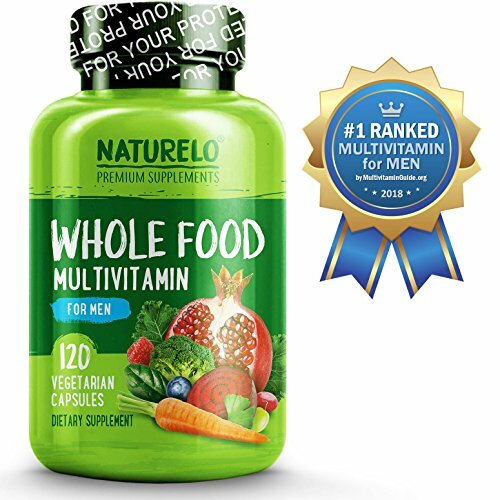 NATURELO Whole Food Multivitamin For Men | Best For Energy, Brain, Heart And Eye Health | Organic Fruit & Vegetable Blends And Wholefood Antioxidants – 120 Capsules. Our Whole Food Multivitamin For Men comes from the gifts of nature; organically grown fruits and vegetables that are packed into potent and high-quality supplements that work naturally with our body. The organic fruits and vegetable blends are a rich source of vitamins and phytonutrients. We also add a wide-range of whole food antioxidants that helps boosts energy and promotes brain, heart and eye health. Our dietary supplements are carefully formulated to assure that they are free of familiar allergens including soy, peanuts, corn, yeast, caffeine, dairy or gluten. NATURELO Premium Supplements, established in 2013 is a small, privately-funded company. We believe that the best vitamins and minerals come from the gifts of nature. Organically-Grown vegetables and fruits that are packaged together to be a powerful high-quality supplement that works naturally with your body. **WHY CAPSULES ARE BETTER THAN TABLETS – It Has No Additives. Capsules Are Made Of Vegetable Cellulose That Helps Supports Digestion. No Damage To Ingredients Because Our Capsules Are Not Compressed And Have Not Been Subject To Heat. Capsule Dissolve Faster And Get Absorbed By Your Body Sooner. If You Have Difficulty In Swallowing, Our Capsules Can Be Opened Easily, You Can Even Sprinkle The Vitamin Powder On Your Drink Or Meal.